In honor of Trump's inauguration, I decided to dedicate the bottom of this week's NYCPlaywrights Saturday email (where I put links to items of theatrical interest, grouped by a single theme) to Canada. Starting with Justin Trudeau reciting Shakespeare. Could you imagine Trump reciting Shakespeare? No, of course not because Trump is a thug and a slob. Like so many Americans, I never paid attention to Canada. Which, when you think about it, is just so weird. First because Canadians certainly think about the USA. Here is Trudeau talking to some kids about Trump - it's a good bet that few American students know who Justin Trudeau is - hell, plenty of adult Americans have no idea who he is, as this Youtube video so clearly illustrates. But another reason it's weird is because Canada is a giant country. It's the second biggest country in the world after Russia (USA is #3) although sure, they only have one-tenth the population of the US but still. A giant country is sitting there, less than 300 miles from where I live, and it is directly across a river from the northern border of the state I live in. Which is a really big state, but still. So I was doing some Googling around, looking for interesting items related to Canadian theater - this item was particularly ghastly - Canada's Hamilton Theatre inundated with angry Americans mistaking it for 'Hamilton' - when I came across information about a play called TRUDEAU STORIES, currently playing at the Great Canadian Theater Company about a young woman who had a Platonic relationship with Pierre Trudeau in the 1980s. Then I found this podcast interview with the author and I really want to go see this show. I am seriously considering the idea of driving up to Ottawa (which is the capitol of Canada in case you didn't know, and you probably didn't even though it's the capitol of a GIANT COUNTRY) next week. It's only a 7 hour drive - about the same distance as Washington DC. 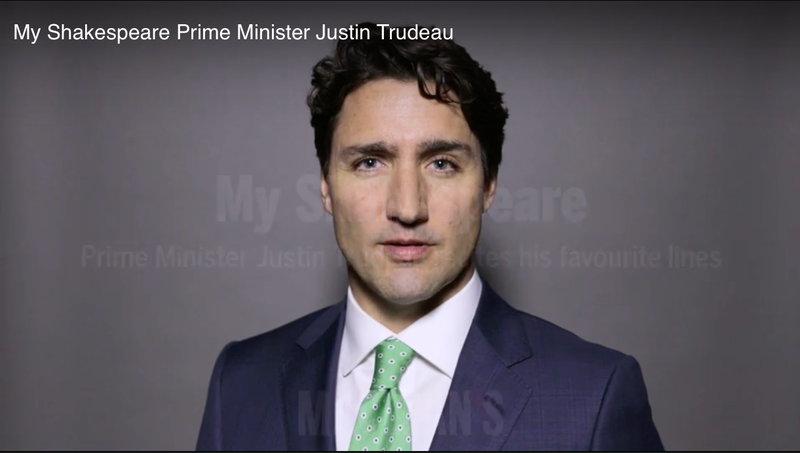 In the podcast the author of the play, Brooke Johnson, mentions that people ask her if Justin Trudeau has ever shown up and she said no, although of course she would love it if he did. Maybe he'll show up this Tuesday when I am (maybe) there - SELFIE TIME! The US is so lucky to have such a good neighbor on our longest border. We really don't appreciate Canada enough, partly because they're so good to us. But although Justin Trudeau can tell you, as he does in this video, that 35 of our united states list Canada as their #1 export destination, Donald Trump, the greatest humiliation of this country (and I once believed that was George W. Bush) most certainly does not know that. Also, I don't think Donald Trump cares whether Americans would be hurt by a trade war, as JTRU seems to believe. Donald Trump only cares about using his position to LOOT the United States on behalf of himself and Vladimir Putin. We would really be screwed if Canada came to hate us. We have to stop taking Canada's niceness for granted. What I'm saying is, we need to start having more appreciation for our dear sweet GIANT neighbor to the north.